Tama's Marching Tenors are innovative in that they offer an easy 4 point adjustment system so the drums can be positioned to fit any player using only a drum key. 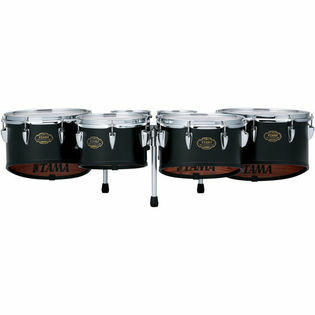 The Tama marching tenors are pre-drilled making it simple to create the perfect configuration. Tama has also incorporated 3 detachable legs to prevent damage to the shells if placed on the ground. The legs do not interfere with marching and can be easily removed for performances. The Tama shells are reinforced with a 32mm reinforcement ring and come standard with edge guard.